2 x 200g white fish fillets such as snapper, dory, etc. Preheat a barbecue or oven to 180°C. Pat fish fillets dry with a paper towel and place each onto a large piece of baking paper. Cut the lemon in half and squeeze over the juice from one half. Layer the dill and zucchini on top of the fish. Season with cracked black pepper. To make a parcel, fold in right and left sides of the baking paper, then start to roll and fold forward till it is nice and tight. Place on the preheated barbecue or in the oven. It will take 5-10 minutes to cook depending on the thickness of the fish. To check that the fish is cooked, carefully open the parcel to allow the steam to escape, insert a knife and look to see that the flesh flakes away nicely. To make the salad, blanch green beans quickly in a pot of boiling water, then refresh in cold water. Combine green beans with watercress, capsicum and black olives. 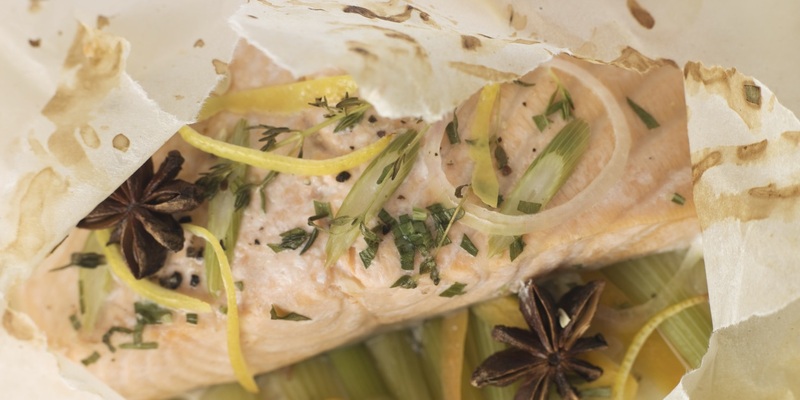 Serve the fish in its parcel with the watercress salad and lemon wedges.